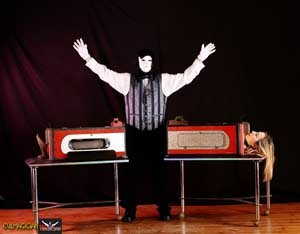 Xtreme Magic Productions (XMP illusions) launched in the year 2000 in the UK. The motivation being to revive performances of classic theatrical stage illusion magic that many modern style magicians and illusionists had cast aside in the never ending quest to provide something new and innovative. XMP seek out and restore magic tricks that have often been abandoned or discarded to the storage shed. With the timeless help and courage of the ever glamorous female assistants all the old favourites can once again be enjoyed by those that indulge in the thrills spectacle and pure fantasy world that is Grand illusion. As if in a time warp XMP illusions transport you back in time to the music hall days of 1921 when an English magician Percy Thomas Tibbles who went by the stage name PT Selbit first performed what quickly became the most iconic magic trick of the 20th century The illusion of Sawing through A Woman!. This spurred on the development of ever more fiendish devices for the magicians to play out the mock tortures upon their hapless female assistants captivating and enthralling audiences worldwide. Moving on to the 1960’s and beyond where cabaret nightclubs and television took over from the variety theatre stage. Magic illusions took on a more compact appearance and now even audience members themselves could take part in the fun on stage. A volunteer “victim” could be chosen to put their head literally on the chopping block in a daring Guillotine illusion or realise their magical fantasy by actually being under the magicians saw blade with no need to have any prior knowledge of how the illusion was being accomplished. For those that are looking for something a little more macabre and extreme in theatrical magic entertainment XMP illusions have just the thing for you .The Evil Magician! You will find our EvilMagician group of characters within Glamourillusions.com elevating the gorgeous and glamorous Magician Assistants to the centre of attention within our downloadable Videos and modelling photo sets. This is a mix of magic illusion and fantasy that is definitely Not for the faint of heart or the very young! Rob based in the South West of England near Bristol is head photographer of the UK side of glamour illusions and Webmaster of the site. Craig a USA based magic illusion fan, collector and performer launched his own photography career during 2011. primarily shooting glamour and magic illusion based material mostly in a studio setting. Located North of Atlanta near Dawsonville, Craig takes care of the United States of America based projects which appear on our joint venture Glamour illusions website. As such Evgulick Photography brings an American perspective to our venture, together with access to a myriad of gorgeous USA models and of course different props and performances to enhance this websites store experience.